The crew on the International Space Station (ISS) have successfully replaced a window pane on the Cupola module. The operation was conducted without any risk to the crew, thanks to the innovative design on the module’s windows, which involves four panes allowing for internal replacement while risking no pressure loss for the Station. 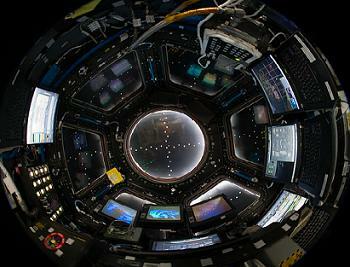 After arriving at the ISS with Node 3, during Endeavour’s STS-130 mission, the European Space Agency (ESA) built Cupola has provided Station crews with a stunning view of the planet, often shared with the public via downlinked photography and thanks to the increasing use of social media by the astronauts. The module also hosts a Robotic Work Station (RWS), allowing crewmembers to actually see Visiting Vehicles (VVs) – such as SpaceX’s Dragon and Japan’s HTV – arrive for berthing, complimenting the camera views of their displays, allowing for increased situational awareness when operating the Station’s robotic assets. Although the windows on the Cupola have suffered from their fair share of impacts from MicroMeteoroid and Orbital Debris (MMOD) strikes, none of the small impacts have caused any serious damage to the module. In the event of the damage being more serious, on-orbit replacement of an entire window is a design feature. Such a replacement would require an EVA to fit an external pressure cover to allow for the changeout, with a pressure cover requiring a flight up to the ISS on one of the cargo resupply vehicles. Several scratch panes are stored on the ISS in the event one requires replacement, which was request by the crew that resulted in the pane being replaced. “Cupola Window 7 Scratch Pane Replacement: The crew replaced the scratch pane on Cupola window 7, the nadir facing window,” noted L2 ISS Status Information. 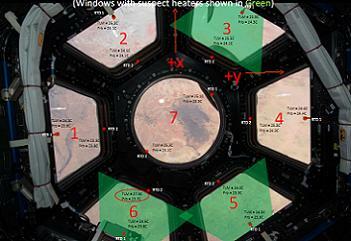 Window 7 is the large round window that astronauts tend to use when taking photography of the planet below. The brand new scratch pane will likely improve – if that’s even possible – the quality of the photographs from the orbital outpost. Onboard, the crew is preparing for a busy period of Visiting Vehicle activity, with the OA-7 Cygnus set for launch on April 18 on an Atlas V from Cape Canaveral. The crew will be using the RWS in the Cupola for berthing operations with the cargo craft. Two days later, the next Soyuz mission will launch on a fast track rendezvous to the Station. Soyuz MS-04 is set to launch NASA astronaut Jack Fischer and Fyodor Yurchikhin from the Baikonur Cosmodrome in Kazakhstan, which is one less passenger than usual. The pick up the imbalance in the crew rotation quota, Peggy Whitson recently agreed to extend her tour on the Station by three months. (Images: NASA, ESA and L2).